Ricardo Barth II, 24, works with the San Gabriel Valley Conservation Corps and Amigos de los Rios to restore urban forests blighted by climate change. 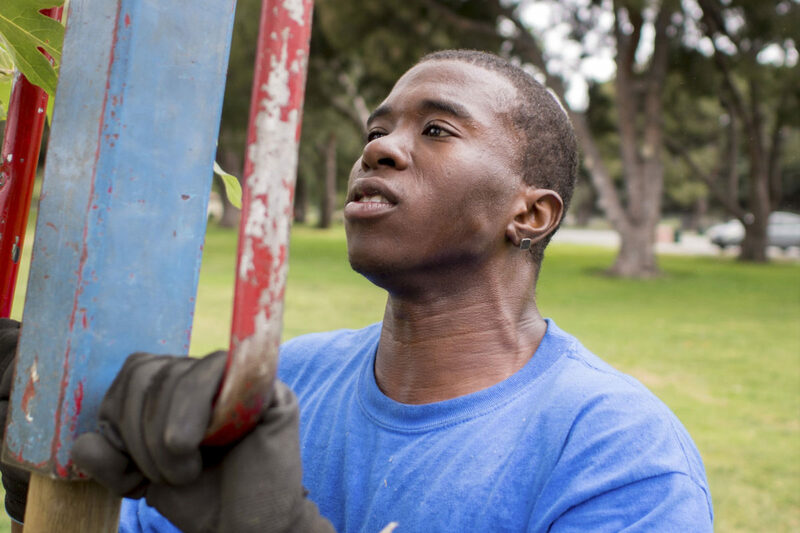 Gaining job skills while building an "emerald necklace" of trees through Los Angeles County. Now, California climate change policies have started to bring hope to these parks and job prospects to at-risk youth and young adults. Living trees produce oxygen, absorb carbon, help with storm water runoff and provide a buffer from the highway for the local kids who come to play as well as for the older adults who garden in the park’s community garden. Today, the full air lets go of a fine mist, the first moisture the area has seen this summer. It’s a good omen perhaps, as about 30 people of high school age and young adults have come out to be part of a tree planting organized and run by Amigos de los Rios, a nonprofit organization on a mission to plant about 230 trees here over time. Today, they are planting a mixture of 20-25 natives and Mediterranean trees: Chinese pistachio, coast live oak and small California redbuds. The diversity helps with resilience and survival rates. Amigos de los Rios received $70,000 to support its work restoring the Whittier Narrows trees via a grant funded by the California Climate Investments program. The money comes from funds paid by polluters for their carbon emissions under the state’s climate change law, AB 32, while additional laws require that a major portion of those funds must support projects that combat climate change while benefiting disadvantaged Californians. 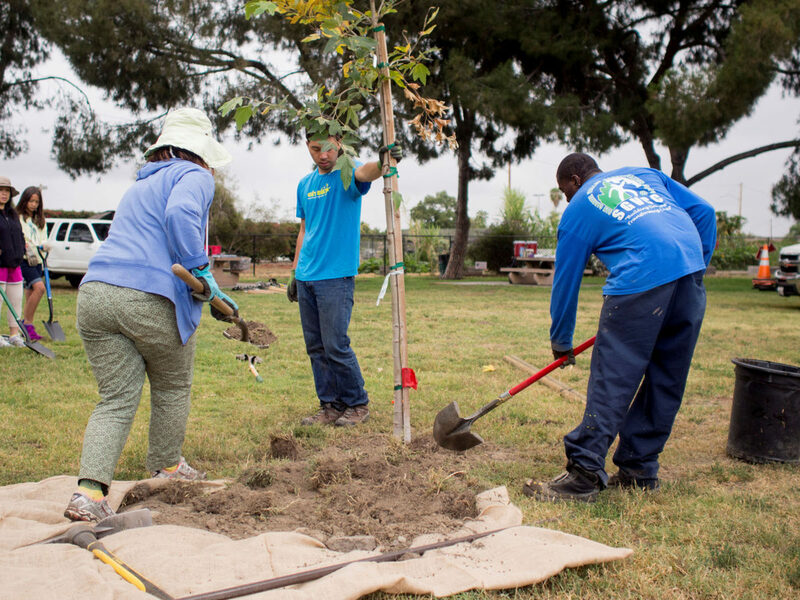 California ReLeaf, which convenes nonprofit and community organizations to support healthy urban forests throughout the state, selected the grant recipients through a competitive process. Amigos de los Rios partners with the San Gabriel Valley Conservations Corps, high school key clubs, Girl Scouts and many other local organizations to leverage the grant through community stewardship and volunteer labor. Over time, Amigos de los Rios will collect data to measure the trees’ benefits on reducing greenhouse gasses and provide additional information on how they support healthy communities. On this Saturday, SGVCC member Ricardo Barth II boarded a bus at 6:30 a.m. near his home in Azusa and came to Whittier Narrows to help plant trees. He doesn’t have a car but hopes to save enough for one with his earnings working with SGVCC. Ricardo, 24, came to the corps from a welfare-to-work program. He dropped out of Azusa High School but later graduated while he worked in another Job Corps program. JJ Ortega is part counselor and part supervisor for at-risk youth doing environmental services work. “I was doing pretty good in school but I didn’t really like school,” he says, explaining that he wanted to do something more physical. Ricardo’s Job Corps supervisor, Jeronimo “JJ” Ortega, says the corps targets at-risk youth who struggle with school, work, homelessness, addictions and the influence of the area’s many notorious gangs. Today Ricardo looks cheerful and at ease here in the park, planting trees and building a berm with his shovel to capture water. Drought has turned the ground to something that feels like concrete. “It was hard at first, but then you learn how to do it. Then you start to enjoy it,” Ricardo says. Through his affiliation with SGVCC he works with Amigos on some Saturdays while during the week he does trash removal, garbage disposal, and planting little trees within the Angeles National Forest at Azusa Canyons and Mount Baldy. “We keep the mountains clean. 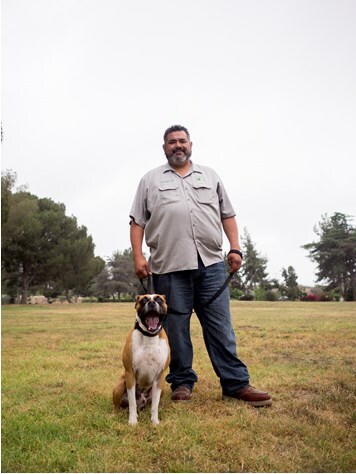 We do trail maintenance and we clean up the rivers,” Ricardo says. He finds diapers, bottles, cans, trash, clothes, but also has the chance to see bears and bald eagles. After working with the corps for a year and three months, he has discovered he wants to be a ranger, ideally in the San Gabriel Mountains. One of the corps’ graduates just got hired as a field ranger for the U.S. Forest Service, says JJ, who heads up the corps’ environmental services division. JJ himself was an at-risk youth, growing up nearby. “I was in juvenile hall. I was in gangs. I spent some time in jail. I think the youth can connect with that,” he says. He also managed to go on to college, raise his son and rise to a leadership position at SGVCC that he has held for eight years. Claire Robinson mentors young urban planners and designers as well as community youth. “I noticed Ricardo right away on a Saturday,” Claire says. “He was totally soaking it up. He wanted to complete everything and get things in order.” Amigos keeps rows of shovels neatly lined up and hoses rolled up on picnic tables. Discipline is a key trait both organizations emphasize. “She shows us how to plant right, how deep to go, what soil to use. She taught me different types of plants. She knows all about plants. It’s exciting. She really enjoys doing her work,” Ricardo says of Claire. 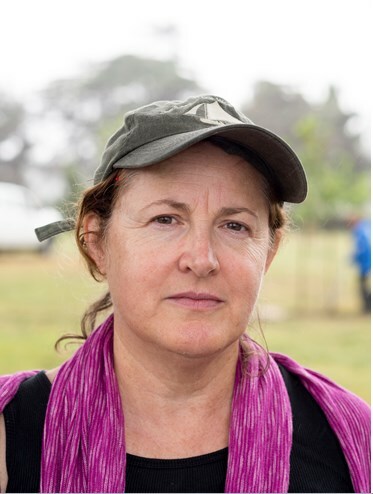 Claire tirelessly dedicates her life to a grand plan she calls the Emerald Necklace, building and restoring a series of regional greenways, parks and trails from the San Gabriel Mountains to the Pacific Ocean. Whittier Narrows is one slice of that plan. “Our culture does not acknowledge the true cost of not protecting the environment,” says Claire. In this case that can mean just being able to go fishing in the San Gabriel River after school or playing a game of soccer under some trees on a summer day.